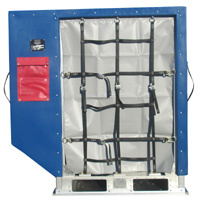 September 05, 2013-- Earlier this month Granger Aerospace Products received TSO authorization for its revolutionary LD-3 air cargo container which was followed quickly by a second authorization for a forkliftable version of the container. After Granger Plastics Company expanded into the Aerospace Industry in 2012 its efforts were concentrated on receiving this essential authorization. Expansion included launching Granger Aerospace Products as a division of the rotational molding company as well as a necessary initial expansion of Granger’s manufacturing facility for production of aerospace products. The continuation of this development occurred as Granger Aerospace Products received its first TSO authorization from the FAA readying the line of revolutionary containers for market. The Granger Aerospace Products unit loading devices (ULD) have a single piece polymer shell that is rotationally molded from polyethylene. The unique properties of this material offer many benefits over other materials traditionally used for air cargo containers. The polyethylene construction of the Granger ULD offers a longer lifespan and significantly lower maintenance costs reducing overall costs of ownership. It is less likely the containers will need repair due to the way the polyethylene behaves under stress. Polyethylene also allows for on site repair of damage dramatically reducing time lost for repairs. Changing from the current materials of fiberglass, aluminum or sometimes polycarbonate may also offer savings in other areas such as fuel burn. Many businesses in this industry are urgently looking for changes that will use resources most economically. The Granger ULD container offers a multi level solution to this issue. Available containers include LD2, LD3 and LD8 as well as forkliftable versions of the three styles. Granger Plastics has a history of manufacturing this type of container and has been involved in custom production of thousands of air cargo containers. This experience led to the pursuit of a proprietary line of air cargo containers. All of the containers produced by Granger are rotationally molded polyethylene and made from the highest quality materials. Granger Aerospace Products are being manufactured in Middletown, OH. Granger Aerospace also offers custom design and manufacturing capabilities for continuing conversions of air industry parts due to the many benefits of polyethylene. Granger Aerospace is a full service facility capable of everything from design to manufacturing and completed assembly. Granger Plastics, a division of Granger Industries, continues to be internationally recognized as a leader in the field of Rotational Molding. Granger Plastics is known for innovative design, superior quality and industry leading solutions for a number of industries ranging from poly tanks for chemical and agricultural use, family safety, defense, Aerospace, Material Handling and more. For more information on Granger Industries or Granger Plastics Company, contact 513-424-1955.